Offer your clients the option to finance purchases up to 2500€ and up to 12 months. 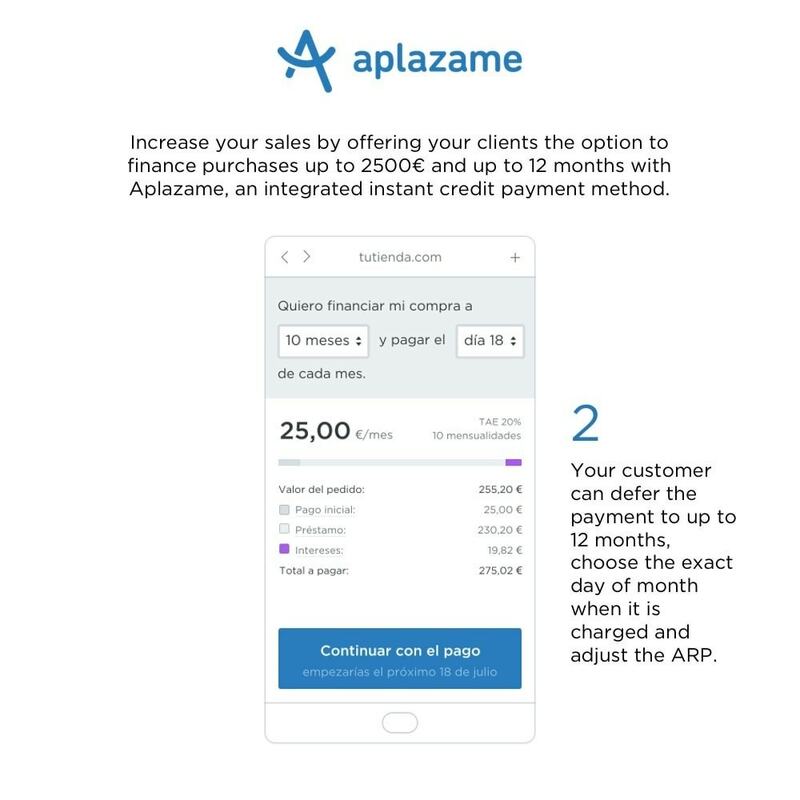 Aplazame is an instant credit payment method for online purchases that allows Magento stores to boost sales by 50% by using financing as a marketing lever. Aplazame allows merchants to sell more and increase average ticket with a risk-free solution. A simple, secure and flexible over time payment method integrated at the ecommerce checkout. 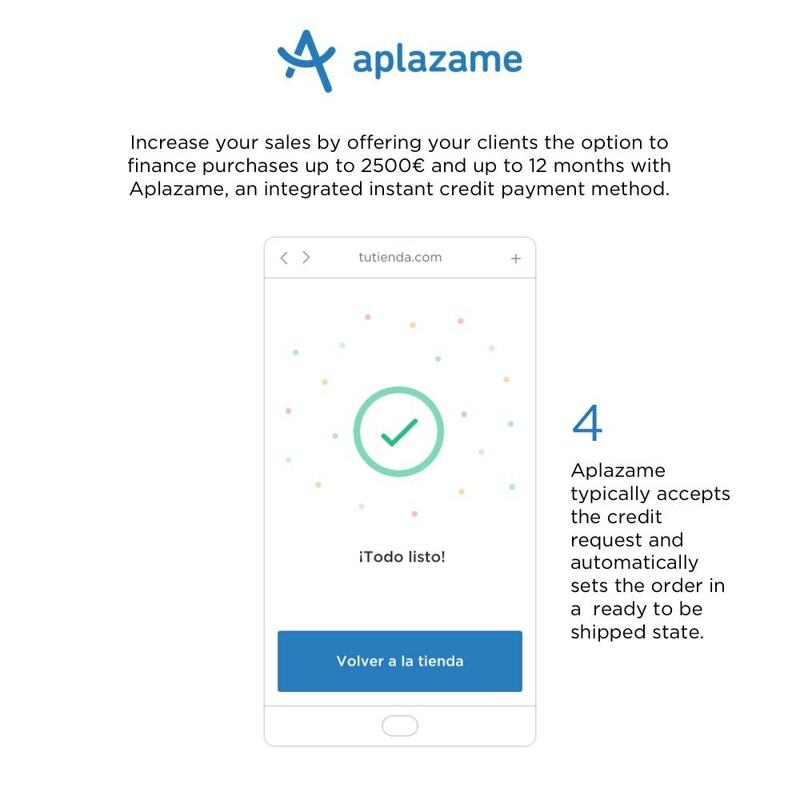 Once you activate and successfully integrate Aplazame in your site, you will be able to take advantage of Aplazame’s widget which is a minimal and fully customizable credit simulator that will be displayed on both your product description and shopping cart views. It will allow the ecommerce to easily communicate the customer the possibility of financing her/his purchases at every step of the customer journey. Customizable widget. It allows merchants to communicate the availability of financing as a payment method across the whole customer journey. Fully customizable for it to match the merchant’s website look and feel. Financing campaigns tool. Merchants can create campaigns to increase their sales at specific promotional periods (Black Friday or Christmas, for example) applying special financing conditions. They decide what percentage of the interest rate they are willing to bear. And everything can be up and running in a few simple clicks. A powerful dashboard to put merchants in control. They login into their dashboard to manage all their daily operations: view their financed sales with the level of detail needed and handle cancellations and partial refunds in seconds. 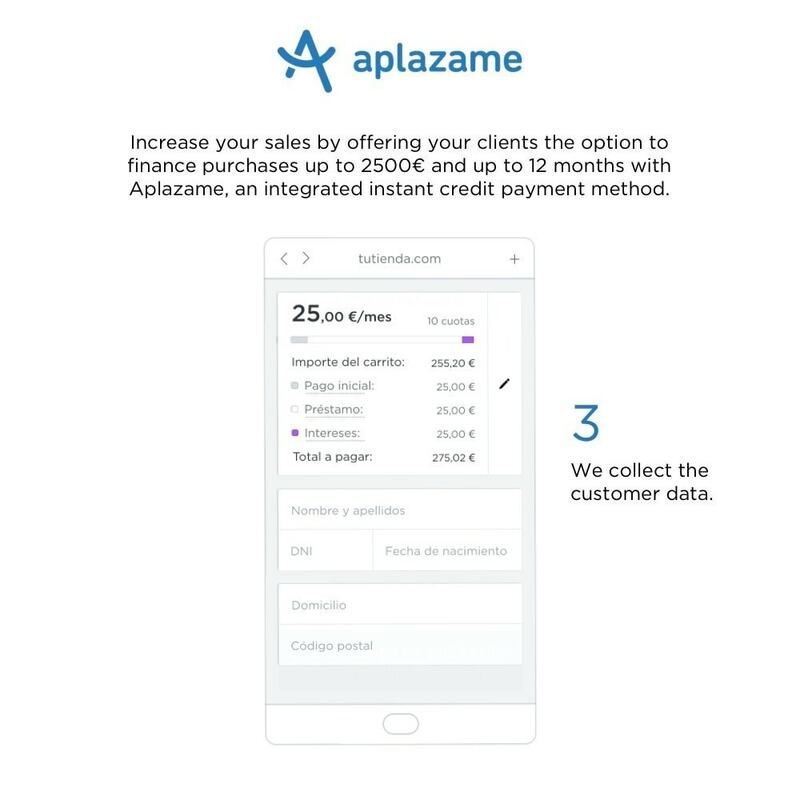 They can finance purchases up to 2500€ and up to 12 months with Aplazame. They buy now and pay later. - The customer simply chooses Aplazame as the payment method at your ecommerce checkout. - The customer can defer the payment to up to 12 months, choose the exact day of month when it is charged and adjust the ARP. 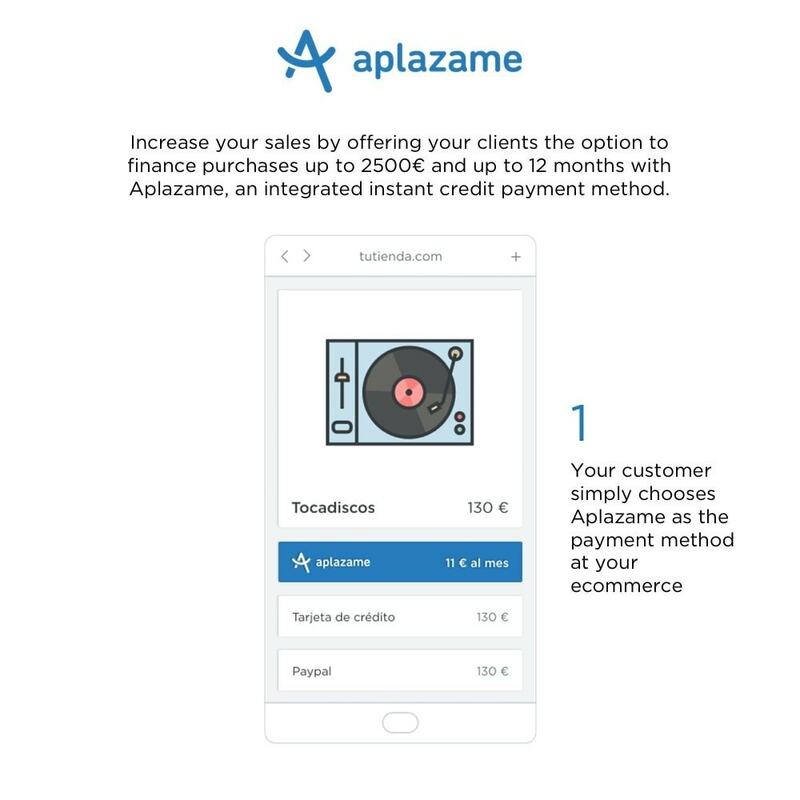 Aplazame will instantly show the interest amount to be paid. - Everything clear, without any surprises or small prints. Aplazame typically accepts the credit request and automatically sets the order in a ready to be shipped state. In less than 10 minutes, Aplazame will be up and running at your ecommerce. 4. Activate it and you’re ready to go! Test Mode (Sandbox): Determines if the module is on Sandbox mode. Private API Key: The Private Key provided by Aplazame. You cannot share this key with anyone!! Public API Key: The Public Key provided by Aplazame. Button: The CSS Selector for Aplazame payment method. The default selector is #aplazame_payment_button. See bellowto configure button with One Step Checkout modules. Button Image: Select the image that appear as payment method on you cart. The default image is white-148x46. [FIX] Minor changes for PrestaShop Marketplace compliance.